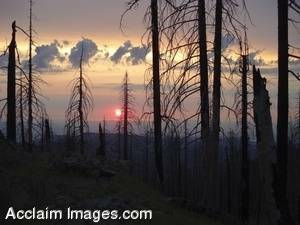 Description: Stock Photo of a Forest Fires Remains. This picture shows whats left after a forest fire destroys a hill located at Grizzly Peak in Ashland, Oregon. This image is available for licensing as stock photography or can be purchased as a poster or as an art print.